The All-NESCAC awards came out today, and we had some very nice inclusions. 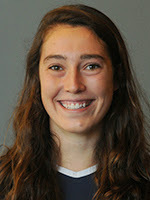 Hannah was named to the All-NESCAC 2nd team. This is her first time receiving this honor. She was in the top 2 in the Conference all season for assists/set, and was consistently on the leader board for service aces as well. Hannah orchestrated our offense, and leads the team not only by dishing out the sets, but with her positive energy, enthusiasm, and game sense. Nice job, Hannah! Becca received the Co-Rookie of the Year award, along with a freshman from Amherst, which is a very nice honor, especially after getting a late start on an already short season! She is the 5th Panther to receive this honor, but none others did it starting the season off with mono. After sitting on the sidelines for almost a month, she jumped in to practice and games and immediately impacted our team, albeit a bit red-faced and winded to start out. She quickly jumped onto the leader board for NESCAC in the top 10 for kills/set, and led our team in kills/set almost immediately as well. Her leadership, poise and court presence were felt right away, and maybe even started emanating from the sidelines in pre-season... Way to go, Becca! 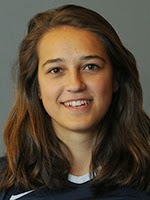 In addition, Lizzy was named to the NESCAC All-Sportsmanship Team, which is very fitting for Lizzy. This honor is a great way to recognize her for being the great role model she is, and for promoting and advocating for greater sportsmanship not only in collegiate volleyball, but life itself. Congrats Lizzy! You are very deserving of this award! 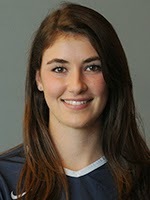 Lizzy also finished the season ranked 4th in NESCAC in digs/set, and was in the top 4 all season. I'd also like to mention a couple of others that have been, or are still on the NESCAC leader board this season. This is quite an accomplishment given the tremendous talent that abounds in the NESCAC, so it's nice to recognize them here. We try not to place too much emphasis on stats during the season, but they can be a very good tool to use to evaluate and assess your skills sometimes and where you are relative to others. I want their focus on the process, not just the outcome, but at the end of the day, it's outcomes that get measured. Olivia was our kills leader for the first half of the season, and was consistently in the top 10 leader board for kills/set. Melanie was on the leader board most of the season, and ended it ranked 8th in both hitting %, and blocks/set, so congrats to both of them as well.